Memorial Day is coming up, and that means grilling season is officially here! We can already smell the burgers, hot dogs, and shish kabobs now. If you don’t already have a grill (or your old one is on the fritz) it’s the perfect time to pick one up. Cape Ace carries a large selection from top brands, like Big Green Egg and Weber. But, before you shop around, use this handy guide to help narrow down your choices. Then, you can enjoy a fun and delicious summer. Size is an important factor, and there are actually two different sides to consider. First, the dimensions of the grill itself. Secondly, the grill’s cooking capacity. The physical size matters because you don’t want a grill that’s too big or too small. For example, if you live in a small apartment, you need a size that will fit on your porch or balcony. Conversely, if you have an open space, a larger grill might make more sense. Portability is a concern, as well. However, even most big grills today come with wheels. Now it’s time to take a look at cooking capacity. Are you cooking for one or two people? A family? Party guests? If you like to host, or you want to start, then opt for a grill that can feed a crowd. Big Green Egg grills come in seven different sizes. The largest option can grill 35- 40 burgers, 14- 16 whole chickens, 18- 20 steaks or even a suckling pig. The smallest size makes two chicken breasts, two pork chops or one steak. Along with size, it’s important to consider how well a grill holds and distributes heat. Heating insulation varies depending on the size of the grill, the materials, the shape of the lid, etc. In particular, Big Green Egg grills provide better heat insulation than any other outdoor cooker available. You can quickly and easily heat the grill to 750º F to sear the perfect steak and burgers. Or, with the help of accurate temperature control, grillmasters can flawlessly grill chicken and seafood to a juicy and flavor-filled finish. How long do I expect the grill to last? Is it safe to leave it outside in the rain or snow? How many uses will I be able to get out of the grill? 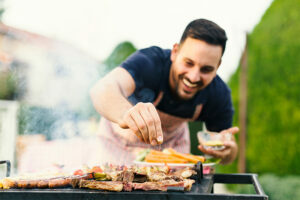 When you purchase a high-quality grill, like Weber, you can feel more confident that it’s going to last. Many Weber models are made with high-performance stainless steel and all-weather wheels. Similarly, Big Green Egg grills are backed by lifetime limited warranties. Thus, the more you invest, the more you’ll get out of it. Not to mention, both Weber and Big Green Egg offer a full line of BBQ accessories. So, you can find things like cast-iron griddles, grates, brushes, and rain covers specifically designed to protect your grill. Now comes the fun part: the features. Cool features help make grilling more exciting and can open up endless possibilities. But, not all grills are created equal. Some offer basic features, while others are fully equipped. Think carefully about what features you might want, need and actually use. Summer is calling, so come on into Cape Ace Hardware to shop for a new grill today. We’re happy to answer any questions and point you in the right direction. Need tools, brushes, parts or covers? You can shop for grilling accessories here, too. Once you find the perfect model, it’s time to invite everyone over, grab your apron and get grilling.